One of my favorite architectural elements of our slate room is the fun ledge that runs along one of the window walls in the room. It's perfect for this lazy gal, who still hasn't hung a single piece of art on the walls of that room! Who needs holes in the wall when you can just lean stuff on the ledge?! And Christmas decor is no exception. I added some fun Santa-themed trinkets to the ledge, including a glitter "ho ho ho" sign I picked up in the dollar bin at Target a few years ago, a picture of my little man sitting on Santa's lap and a stuffed Santa. 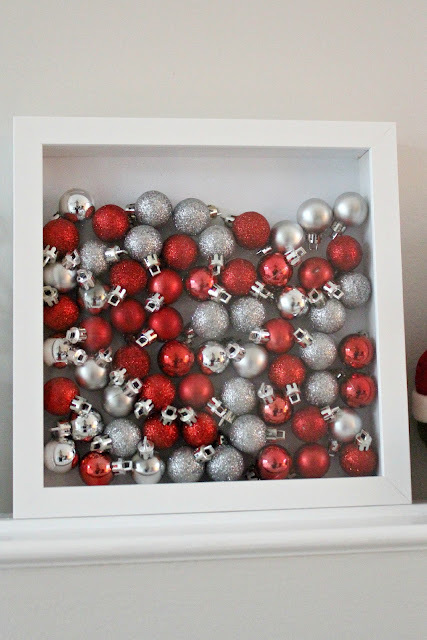 I also filled up an Ikea shadow box with some tiny ornaments. Aren't they cute?! 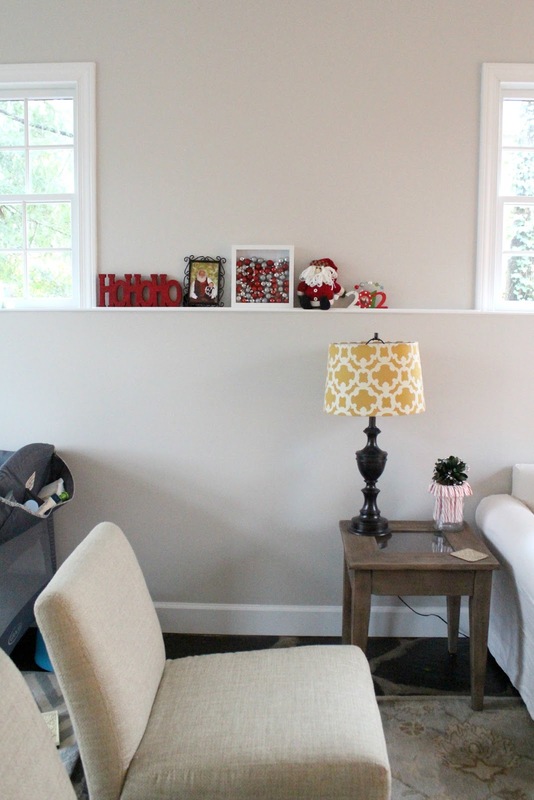 I think this sweet and simple vignette brings some fun cheer to our living room, don't you? PS. 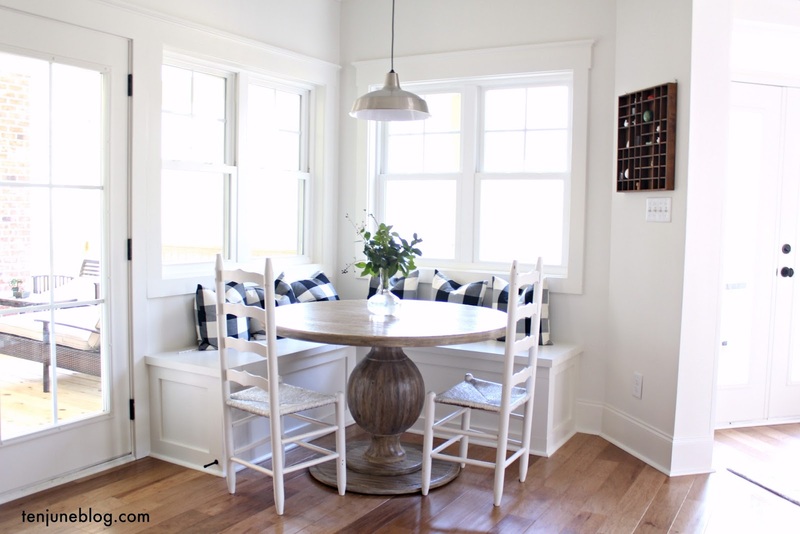 You know you wish you had a gigantic changing table/pack n' play in your living room, don't you? Be jealous. 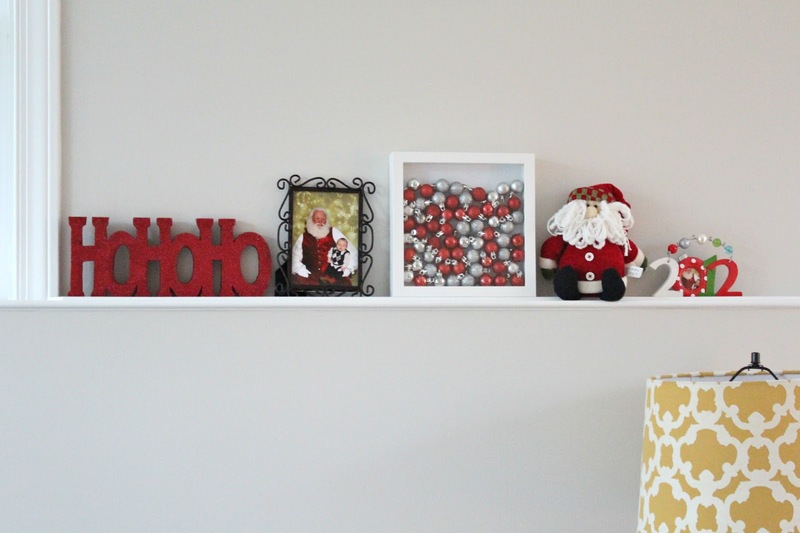 Got any fun holiday decor spots around your house? 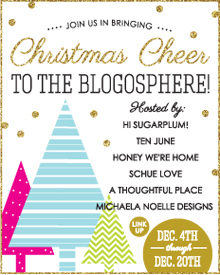 Pop on over to Courtney's to link up! Such cute details!! I love your lampshades by the way. I never even dreamed of a shadow box with ornaments. Such a sweet idea. Thanks for linking up, friend. What a magical Christmas for you with baby. Hugs. These look absolutely adorable! I love all of these little touches! The shadow box with the ornaments is a great idea!! Super cute and creative! Simple and cute! Love the little box of ornaments. Perfect, Michelle!! Love the shadow box idea -- hope you and the little guy are doing well!